The best video game sidequests are detours worth taking. They can be even more delightful than a good game’s main quests by their very nature of being optional. Bad sidequests are tedious filler that are best ignored. Those good ones, however, were made for you to find and enjoy, but only if you want to. I found some great sidequests in Far Cry 5 early last year and just got back to finishing them in the last week, as I took a break from playing more recent releases. They’re called Prepper Stashes, and they amazed me. They’re a wonderful deviation from the series formula. These games are mostly about chaos, but each of these Prepper Stashes is a conundrum set in relatively calm crevices of these violent Far Cry worlds. They’re also coming back in a modified form in next week’s Far Cry New Dawn, a return I learned more about as I quizzed Ubisoft about how Far Cry 5’s superb Prepper Stashes came to be. 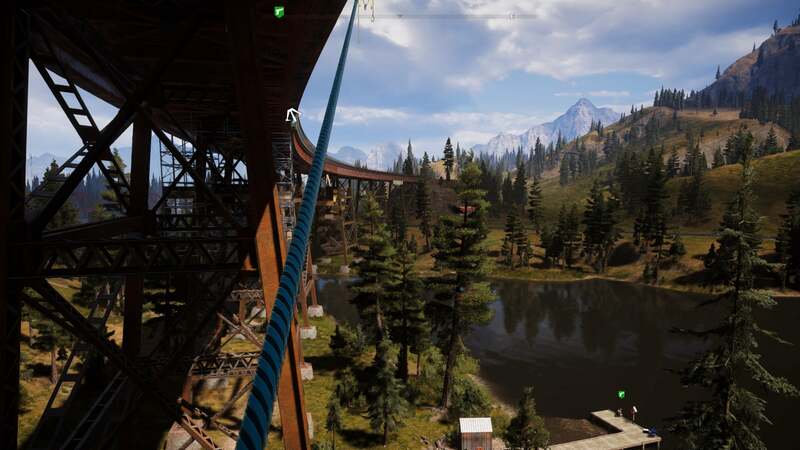 The big Far Cry games of late offer satisfying first-person shooting set in a vast, violent open world full of bases to raid, animals to fend off, and vehicles to commandeer. They have main missions and side tasks, but they deliver their best fun when players roam a map that is always on the verge of eruption. You stalk an enemy soldier only to get pounced on by a bear, rush to a Jeep to escape, get chased by an armed patrol helicopter, drive off a cliff, and dive into the sea. That’s the series’ thing. It’s cool. Prepper Stashes are different. In Far Cry 5’s fictional Hope County, Montana, the towns and countryside are overrun by a violent, religious doomsday cult. Hidden throughout are hideouts made by “preppers”—people preparing to survive a catastrophe by building shelters and stockpiling necessities. The Prepper Stash missions involve accessing these hideouts, all of them abandoned and all of them initially blocked off by some sort of environmental puzzle. Or sometimes the prepper was trying to flee Hope, but they left their stash behind in a box that can’t easily be cracked open. Far Cry games are knocked for being formulaic to the point of being repetitive. If you’re not into, say, stealthily raiding a base filled with a dozen guards, a few explosive barrels, and a caged attack dog, then you’re going to be tired of these games before any one of them presents the tenth such base to take down. Some of us find the basic mechanics and the myriad ways attacking such a base can unfold to be fun enough, but the Prepper Stashes need no defence against monotony because they’re refreshingly varied. There’s a clever one set in an overstuffed garage and another in a toxic mine. Greco said the dog poo one is a team favourite, and that a fan favourite is the game’s Prepper Stash that involves a haunted house. One of the reasons I got back to Far Cry 5 in the last week is because I am fascinated by the fact that Ubisoft is releasing a sequel, Far Cry: New Dawn, next week, just 11 months after 5 came out. I’m curious how the game will connect to the original. It’s set 17 years later, after a disaster has transformed Hope. I figured I’d experience all of FC5’s story and then see how New Dawn references it, but as I went back I kept breaking from the main path to do more of these Prepper Stashes. That got me wondering if New Dawn would be making callbacks to that design features as well. It will, Greco said.